Throughout the year Madrid hosts an array of fiestas that liven up its streets and welcome visitors to the city, but few of them spread to as many parts of Madrid as the Christmas celebrations. At the end of November the Christmas lights created by some of Spain's finest designers are turned on and the city is filled with a magical air. The streets are dressed in all their finery, the trees take on a Christmassy look, and shops and markets are stocked up with all kinds of gifts. To get a taste of Christmas in Madrid start by going to Plaza Mayor, where you can see one of the city's best known Christmas markets, selling figures for Nativity scenes, decorations and even Christmas trees with all the accessories you could possibly want. The Plaza Mayor is also a perfect departure point for the discover Madrid, which invite everyone, including children and those with disabilities (hearing, visual, physical or mental), to learn more about the history of Nativity scenes, seasonal traditions and sweets. Going on one of these tours is a wonderful way to discover some of Madrid's special spots. 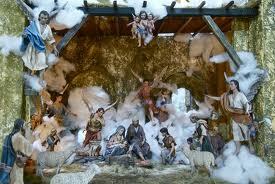 The City Council organises exhibitions of Nativity scenes on its premises, where you can admire models which depict the birth of Jesus, from Mary and Joseph's journey to the adoration of the Magi in the stable. If you fancy a bit of shopping, then head for the city centre between Sol, Gran Vía, Plaza Mayor and Callao; there you will find all kinds of shops at which to buy all the presents on your list. Children can give their letters to Father Christmas and the Three Kings' pages and then enjoy the Cortylandia show in the entrance to the Corte Inglés in Calle Maestro Victoria. The fun doesn't stop here, however. On some of the city's squares you'll find temporary ice-skating rinks; other plazas, such as Jacinto Benavente, Santa Cruz and Plaza de España, are lined with stalls selling craftwork and fancy dress costumes. 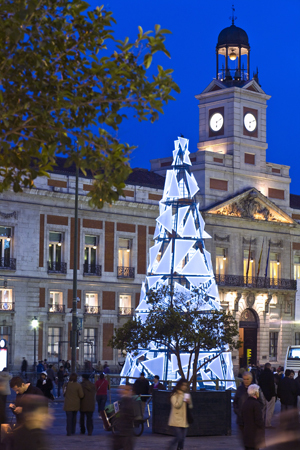 On the last day of the year Madrid hosts two unmissable events. In the evening the spotlight is on sport, as runners take to their marks for the San Silvestre Vallecana, an increasingly popular race, which has been taking place for over 30 years and is both professional and a fun run. At night, however, all eyes turn to Puerta del Sol the epicentre of the country's New Year's Eve celebrations. It's the perfect spot to see in the new year and eat twelve grapes for good luck as the clock on the Real Casa de Correos strikes midnight. Afterwards, parties kick off across the city, continuing well into the following morning. 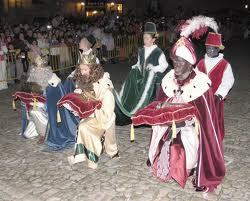 Christmas is a time for festivities, tradition, decorations and, of course, gastronomy. Food, especially sweets, plays an important part in the celebrations. To round off a perfect Christmas share a roscón de reyes (a traditional ring-shaped cake), some nougat or polvorones before or after the Three Kings Parade, which crosses the city centre on January 5. A sweet ending to an unforgettable Christmas in Madrid.